It can be a real struggle to find lots of good paying gigs. A small amount of local bands seem to get the best gigs while the rest of the bands make little or no money at all… if they can even get a decent gig. Fact is, most club owners love to pay bands well - when the bands are helping the venue to earn a lot of money. But club owners lose money on nights when a band doesn’t draw a lot of people. They also need variety. They don’t want the same 4 bands playing there every weekend. They ARE looking for new bands, but these new bands need to help them earn good money. So the more money you generate for club owners, the more in-demand you become and the more money you earn from each gig. Sounds hard to do? It’s not. I’ve created a free eGuide about how to get more gigs. 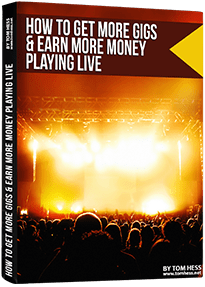 You will discover what successful musicians do to get the best-paying gigs in their area. The top 3 reasons why musicians struggle to get gigs and how to make yourself immune to these issues. What venues, booking agents and music fans really want from you (and how to give it to them). 8 killer ideas that get more people to come to your shows, help you make more money and make you loved by club owners & booking agents. How to make your shows different from other bands and musicians (this helps you attract a lot of new people to each gig you play). How to use social proof to grow your fan base and get more gigs. 2 goals to work on that get your fans coming back to see you again and again. How to earn a lot more money from each gig before you ever go on stage. How to earn a good, reliable and stable income as a performing musician. How to go from playing cover songs to playing original music (and have your audience look forward to hearing your songs!). 9 powerful implementation shortcuts that help you easily apply each idea you learn. Ideas alone are useless without a strategy to implement them. I show you how to make the implementation process easier to avoid getting stuck with ideas you can’t use. To learn (for free) how to get a lot more music gigs, enter your name and email, and click the 'Give Me Access Now' button. All information is kept 100% private and confidential. Tom Hess Music Corporation is not in any way affiliated with Facebook Inc.